A wild spring Chinook salmon swims in the Willamette Basin's McKenzie River. Photo by NFS Fellow David Herasimtschuk of Freshwaters Illustrated. Evaluate Volitional Fish Passage at Detroit Dam! Native Fish Society is fighting to recover Oregon's most imperiled wild fish by building a groundswell of public supporter to advocate a Roadmap for Recovery for the Willamette's iconic salmon and steelhead. And we are challenging the management agencies in court, assuring that the legally required recovery actions are implemented in the basin. Built and operated by the U.S. Army Corps of Engineers, a network of thirteen dams are located throughout the Willamette basin blocking access to critical salmon and steelhead spawning habitat. Adult Chinook and steelhead cannot get over the dams—there are no functioning fish ladders. Juvenile fish struggle to migrate downstream through the large reservoirs and often cannot move past the dams without being forced through turbines. Along with the physical barriers these dams impose, they further harm fish and the river by altering natural flows, contributing to diminished water quality, and degrading riparian environments. Because Willamette Chinook and steelhead are listed as threatened under the Endangered Species Act, the Army Corps has a duty to ensure the dams do not jeopardize their survival and recovery. National Marine Fisheries Service issued a complete list of actions in 2008, identified in a Biological Opinion, that the Army Corps must take to protect these species and ensure recovery. The agency said that the critical actions needed to recover Willamette salmon and steelhead are fish passage for adults & juveniles, improved water temps & flows downstream of dams, downstream habitat restoration, and completed Hatchery Genetic Management Plans. Ten years later, many of the required actions have not been undertaken. Many of the deadlines in the Biological Opinion and agreed to by the Army Corps have been missed. The result: Willamette salmon and steelhead populations are circling the drain. Last year, fewer than 5,000 wild spring Chinook and less than 1,000 wild winter steelhead made it back to the river. This represents just one to two percent of the historic populations that once returned to spawn in the system’s cold, forested streams like the Molalla, Santiam and McKenzie Rivers. Willamette salmon and steelhead face a high probability of disappearing forever with a ninety-nine percent chance of local extinction in some tributaries. Without drastic action now, we will lose these icons of our landscapes and northwest heritage forever. What role do these fish play in our community? Willamette fish provide a multitude of benefits including supporting healthy ecosystems that supply drinking water to our communities, the cultural heritage needs of indigenous people and tribal nations, and commercial and recreational fishing economies. The Willamette River in Oregon flows 180 miles out of the Cascades and Coast Range Mountains to its confluence with the Columbia River in the city of Portland.The river drains 11,487 square miles, nearly 12% of the state, flowing through a wide, fertile valley that is home to 75% of Oregon’s population and is the state’s agricultural powerhouse. The Willamette has been important to many Native American tribes that have relied on the river for millennia for salmon, as a trading hub, and as a source of water and other critical resources. Restoring natural processes that have been altered by dams will benefit our fish, our ecosystems, and our communities that depend on these homewaters. Detroit Dam on the North Fork Santiam River blocks 70% of historic spawning habitat for threatened wild fish. Photo by Conrad Gowell, NFS Fellowship Director. In the mid 1900’s, the Corps built a series of thirteen dams throughout the basin with the primary purpose of flood control. These dams failed to provide fish passage along the east side of the Willamette valley, thus blocking access to much of the highest quality habitat in the most historically productive systems. This further diminished a wild salmonid population already stressed by the impacts of hatchery competition, overharvest, and habitat destruction. The North Santiam, once home to an estimated 23% of the Willamette's spring Chinook and 34% of systems winter steelhead, lost an estimated 70% of its anadromous fish habitat with the construction of the Big Cliff and Detroit dams. For nearly two decades efforts to re-establish Spring Chinook above several of the dams through an adult outplanting ‘trap and haul’ program have provided non-volitional fish passage to the highest quality habitat within the historical anadromous range. Though this program has achieved some success despite the lack of safe downstream fish passage, the population has thus far been comprised purely of hatchery fish. Wild fish will not be utilized in this program until downstream fish passage issues are addressed at the dam. What’s troubling is that these runs are entirely dependent on human intervention and will never meet the definition a self-sustaining population. Only with volitional fish passage can viable, self-sustaining abundance be achieved. Of key importance is establishing effective downstream passage for juvenile fish attempting to migrate to the ocean. The reservoirs created by dam operations and the lack of safe and effective passage through the dams has been identified in the Biological Opinion as a significant barrier to recovery. Operation of dams for flood control and other purposes, including hydropower and recreation, have resulted in unnatural flow patterns downstream of Corps projects. Normal operations result in a reduction of natural flows in the spring, when fish need higher flows for downstream and upstream migration and higher summer and early fall flows that can dewater redds when river levels drop in late fall and early winter. Discharge from the dams has resulted in unseasonable water temperatures degrading the aquatic habitat below, diminishing potential for both spawning and rearing of salmon, altering the biological timing of key lifecycle processes, and resulting in high rates of pre-spawn mortality. Operational adjustments at several dams including Detroit Dam have resulted in some improvement to water temperatures in downstream reaches. 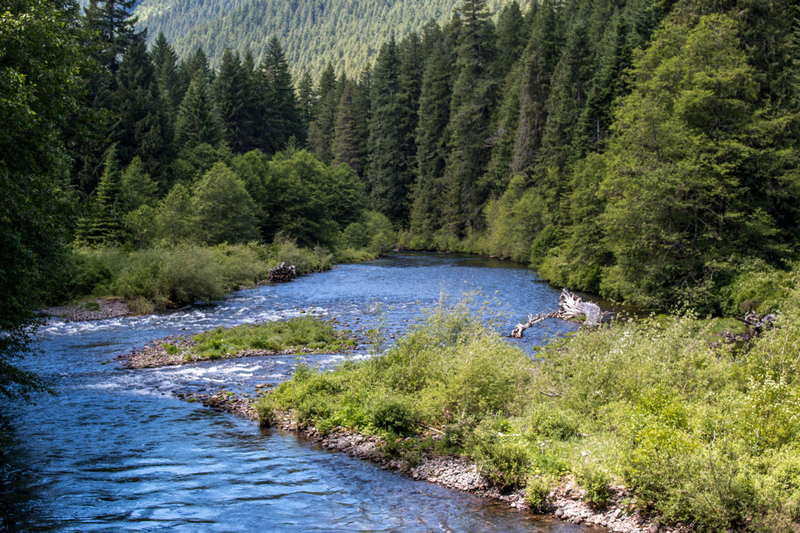 A Water Temperature Control Tower has been proposed to fully meet the downstream temperature needs of the North Santiam but is significantly behind schedule while a temperature control facility has been built and is operational for Cougar Dam on the McKenzie River. Improve volitional downstream passage for juvenille fish. Outplant adult hatchery Chinook salmon above Green Peter dam to study spawning success and juvenile downstream migration through Green Peter. Re-evaluate and establish new flow targets beyond minimum biological flows before providing water allocation to other water users. Reform, reduce, or eliminate hydropower operations to eliminate power peaking and benefit listed fish. Approve and follow Hatchery Genetic Management Plans to protect wild fish from hatchery fish and reduce the rates of hatchery fish spawning in the wild. Read more about hatcheries effects here. Conduct a basin-wide assessment to identify anchor habitats and opportunities to correct smaller passage barriers to access those reaches. Fund and implement habitat restoration and improvement in undammed tributaries like the Molalla, Yamhill, Marys, and Coast Fork Willamette. We have seen time and again that having the law and science on our side is not enough to ensure change for wild fish happens in the Willamette. A series of favorable legal rulings and extensive research in the basin have not resulted in the on-the-ground actions that are critical. It is the dire situation ­of our wild fish that brought together a group of concerned parties from both angling and conservation organizations to discuss whether we could find more effective ways to advocate for these fish collectively. From these initial discussions, we found common ground regarding what we all want to achieve. We know that we can be more effective if we all pull in the same direction. By sharing information and perspectives, we have the opportunities to craft a shared roadmap of policy positions that are supported by our respective memberships as well as other organizations, businesses, entities, and individuals.Through building a diverse and broad coalition that advocates together, we will increase our political leverage and the chances that substantive change will be enacted. Our Mission: Joining together to promote and support recovery of wild salmon and steelhead in the Willamette basin. Our Vision: A Willamette River that supports healthy, self-sustaining and harvestable populations of wild salmon and steelhead, with increased recreational and angling opportunity and communities that are fully committed to supporting a clean, healthy river to pass along to our children. How: By establishing a broad coalition of stakeholders concerned with the state of the threatened salmon and steelhead fishery in the Willamette Basin. As a coalition, we will use our combined skills, resources, and political leverage to envision and execute a shared roadmap to recovery for these fish. Will you join us? If you agree with the mission and vision of this collective, then please join us in our efforts. 2008 - Biological Opinion issued by NMFS. NMFS required the Corps to complete numerous actions by specific deadlines in order to recover Upper Willamette Chinook and steelhead. These deadlines would not be met. November 2019 - NFS and our partners file a Preliminary Injunction against the Corps asking the court to direct the agency to immediately implement feasible and achievable operational adjustments to Willamette dams to benefit threatened wild fish.